ModNation Racers on PlayStation 3 may be a fine racing game, but its frequent 30-plus-second load times are lamentable. Good thing one of the game's producers told us a fix is coming. "That's something we are aware of," ModNation producer Dan Sochan told Kotaku on our latest edition of Kotaku Talk Radio when I mentioned the loading-time complaints to him. "There are certain reasons why we did the loading that we did, to keep transfer times between characters, karts and tracks when you're racing against people online, that all of those are really quick. But we are working on it and expect an update." An update that might shorten the load times? "Yes." 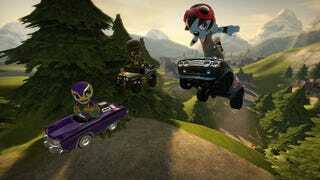 ModNation Racers, like LittleBigPlanet also on the PlayStation 3 has been built to enable players to heavily customize their content — in this case their racers, race cars and tracks. Balancing the ability for gamers to share their creations and for the game to run swiftly is a challenge. Let's hope that a little more tweaking and the presumably downloadable update to which Sochan referred improves things all around. Don't wait for us to tell you about the many secrets revealed in each weekly episode of Kotaku Talk Radio. Listen live each Wednesday at 11am Mountain Time. Or download the show onto your favorite listening device.